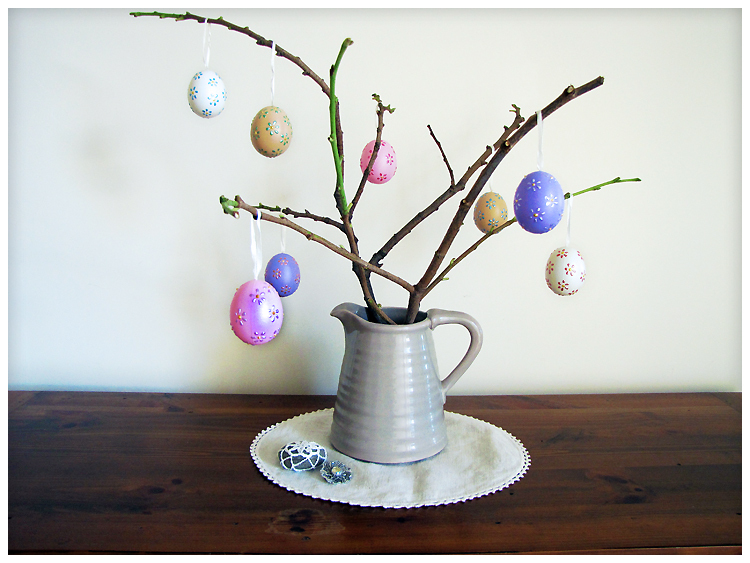 I don't usually decorate for easter, but I kept seeing pictures of easter egg trees around the internet. They are pretty cute, and really, why turn down an opportunity to make a little tree and hang decorations from it? 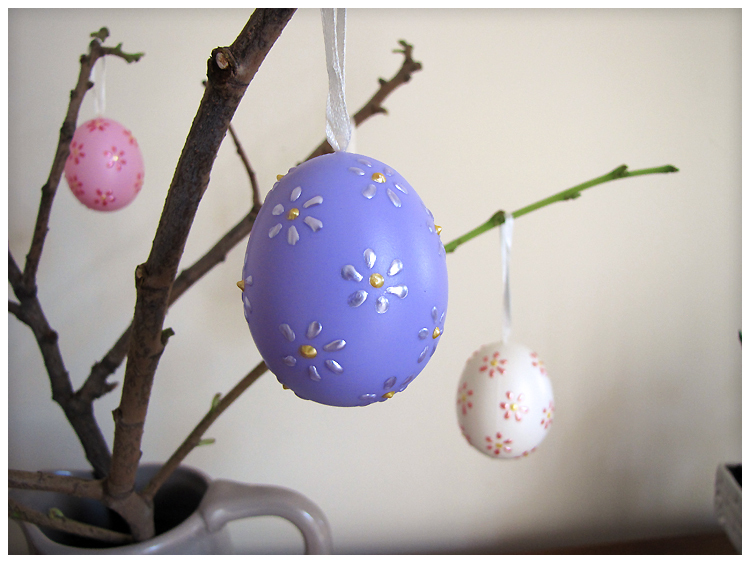 Read on to find out how I made these cute little egg decorations. 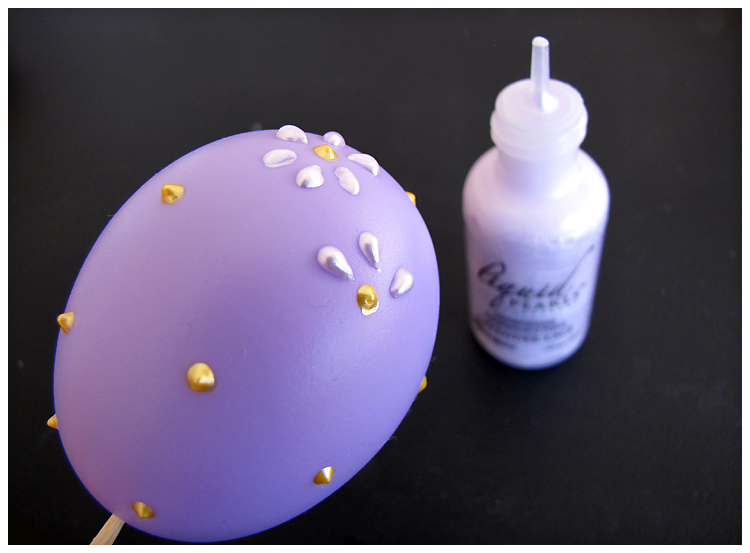 I used Liquid Pearls to paint tiny flower designs on the eggs. These eggs happen to be plastic, but you could go old school and blow the yolks out of some real eggs too. 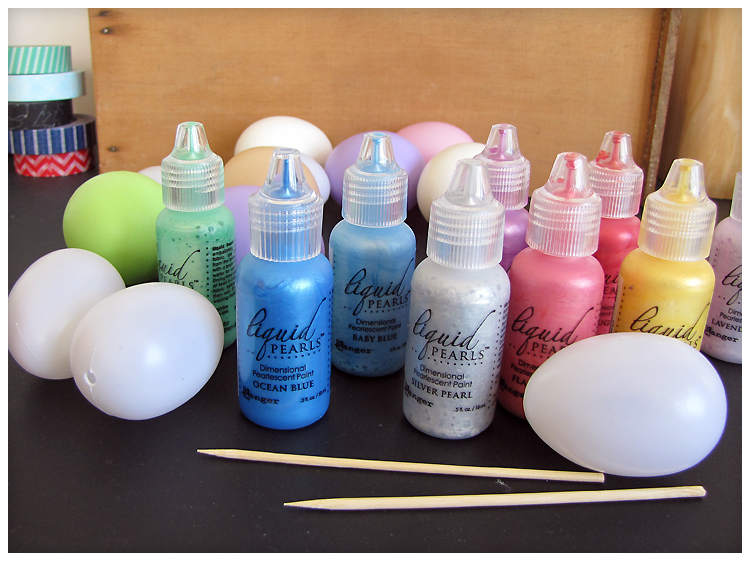 Liquid Pearls are a really handy craft product to have lying around! I've used them on all sorts of things from cards to candles. They are a dimensional pearly paint, which you squeeze on in a little blob and it stays raised up when dry. (Here is a good place to buy Liquid Pearls.) You will also need some plastic craft eggs, wooden skewers, thin satin ribbon, and glue. You can use as many or as few colours as you like. My eggs were different colours, so I used several different paint colours as well. If your eggs are all white, it could look nice to just use two or three paint colours for the flowers. 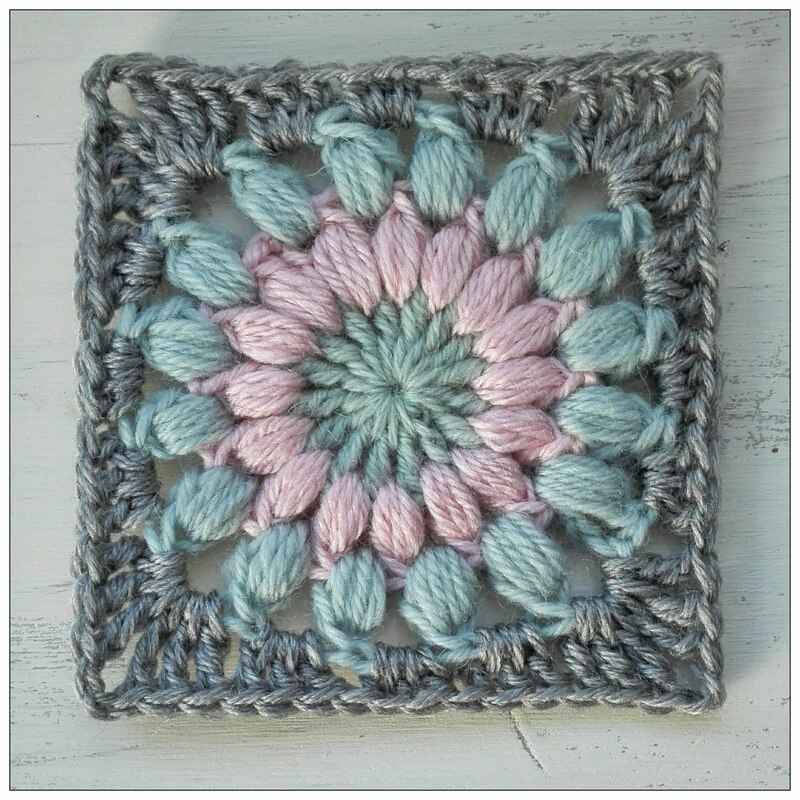 The colours I used were Buttercup, Baby Blue, Lavender Lace, Mint, and Petal Pink. Use the Buttercup Liquid Pearls to make dots for the centres of the flowers. Make sure they are well spaced out to allow room for petals. 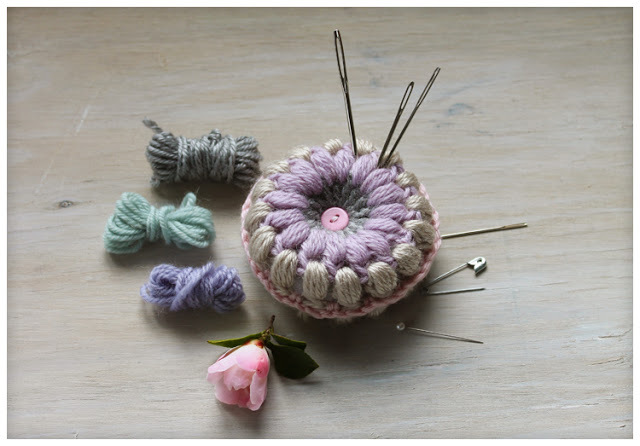 Use a second colour (here I'm using Lavender Lace) to make the petals. To do this, squeeze out a dot of paint, then move the nozzle in towards the centre to extend the dot in a petal shape. Do five or six petals for each flower. Then put the end of the skewer in some blu-tack or a piece of foam or polystyrene until the paint dries. Cut a piece of narrow satin ribbon for the hanging loop. 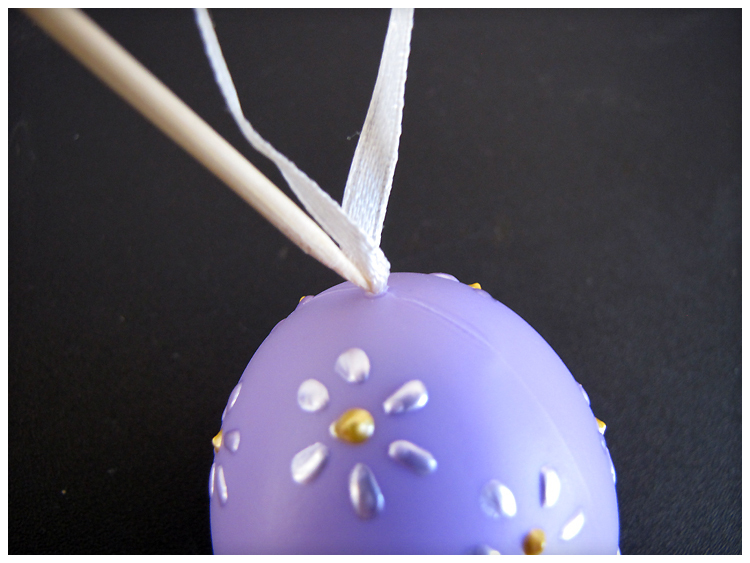 Cut the ends of the ribbon on a sharp diagonal, then use the wooden skewer to push them into the hole in the end of the egg. Then secure with a drop or two of glue. 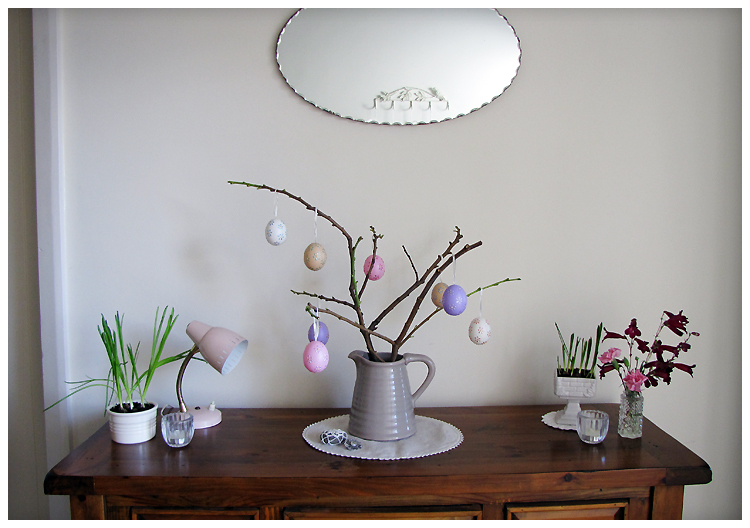 Make an easter egg tree by securing a couple of twiggy branches in a vase (use a flower frog to hold the branches so they don't flop around). 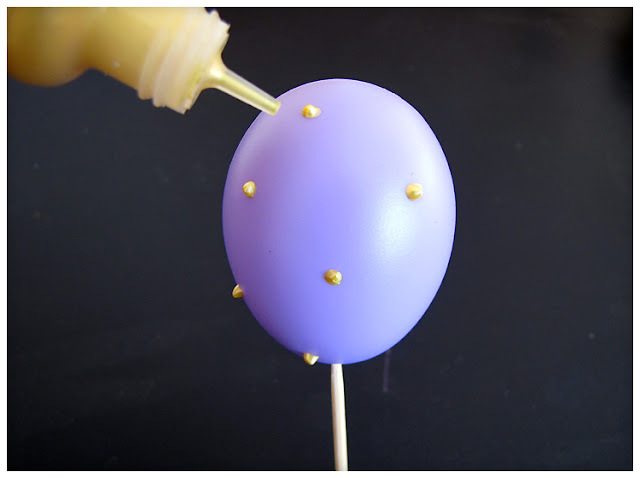 Then decorate with your eggs. I think eggs in different sizes would look cute, and crochet flowers never go astray. This might be the first time I decorated for easter, but it won't be the last! Do you decorate? Have you ever done an easter egg tree?